During the seventeenth century, when Netherlandish painters often specialized in certain subjects, it was not uncommon for two or more artists to collaborate on a single work. In this picture the flowers were painted by Seghers and the sculptured stone cartouche by Quellinus, who is known to have worked with Seghers on several occasions. Seghers, a Jesuit monk, learned his specialty of floral garlands in the studio of his teacher, Jan Brueghel. A favorite of Flemish painters, these colorful clusters were often enhanced by being placed against monochromatic backgrounds. Here the garland contains almost two dozen different floral species and a variety of butterflies, attesting to the growing interest in documenting the natural world. 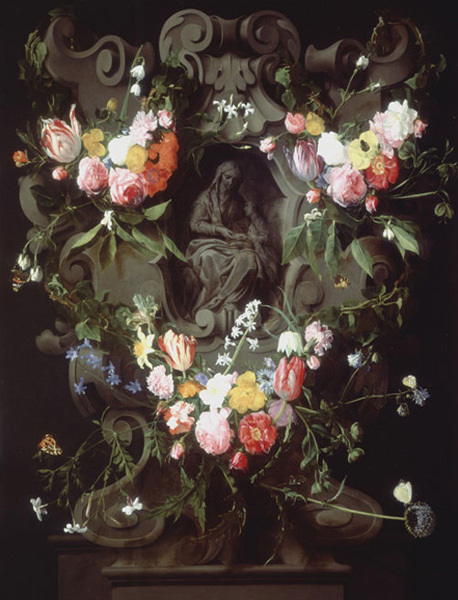 The attention lavished on the garland gives it precedence over the painting's central subject, the Virgin with her mother, Saint Anne. Close examination reveals that the seated figure originally held the Christ Child on her lap and therefore represented the Virgin Mary. When the child was painted out and the standing figure was added, the subject became the Education of the Virgin.